America's fascination with its comparatively young musical heritage reached its zenith with the advent of Broadcast Radio. Though access to classical music venues had been traditionally limited to people of means prior to the 20th century, folk music, jazz, and blues, as well as the rich tradition of religious music, found its way into most people's lives one way or the other. But it was Radio that exploded American and International music into the homes and offices of exponentially greater numbers of American citizens than ever before. In fact it was music that was first aired over the earliest Radio receivers. And indeed, music dominated early Radio for its first, stumbling ten years. This was music that seventy percent of America had never even had access to before. The Metropolitan Opera began airing live Opera broadcasts in 1931, hosted by Milton Cross. The Met broadcasts continue to this day--almost 80 years of uninterrupted broadcasts. Milton Cross left the series in 1974, but he was also regularly heard in a fascinating, albeit a bit less stuffy, series entitled The Chamber Music Society of Lower Basin Street, which ran from 1940 to 1952. The ambitious Works Progress Administration and its Federal Music Project funded and recorded thousands of exemplars of the finest American music ever before assembled in one canon. As educational as they were entertaining, the better broadcasts, such as those from The Met, and The Chamber Music Society of Lower Basin Street at the other end of the spectrum, invariably delved into the history of both classic and popular music during the course of each broadcast. Milton Cross had a passion for the history of music and his presence on both of the above mentioned popular programs set a high bar for all such programming that followed them. The Armed Forces Radio Service was also responsible for creating some of the most extensive and historic collections of jazz and popular music in American history with its Jubilee, Downbeat, and One Night Stand programming, among hundreds of others. Indeed, the various music programs among the vast AFRS and AFRTS canon represent some of the largest single collections of popular music of the era. Big Band music and literally thousands of Band Remotes aired between 1935 and the end of World War II. Without putting too fine a point on it, its safe to say that America, since the very advent of Radio, has maintained an insatiable appetite for music--in any form. Music for pure entertainment's sake has understandably remained the most popular format for American audiences. But the more informative and educational musical programming from The Golden Age of Radio remains its most valuable legacy. 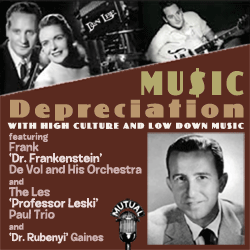 The term 'music depreciation' is an interesting enough play on words in and of itself. Spike Jones and His Orchestra may well have coined the term in the course of their various irreverent, but brilliant send-ups of popular--and traditional--music over the years. Their aim being to both knock some of the most revered classics off their pedestals a notch or two, while at the same time deconstructing some of the most popular classics and contemporary music to their basic common denominators: beat and meter, dynamics, and harmony. Spike Jones, while ostensibly clowning with famous music, was brilliant at breaking down those three key essentials to illustrate what made truly great music great. Kay Kyser had also been a proponent of musical deconstruction. Over the course of their combined forty years of influence in musical entertainment, they both helped to fire the imaginations of countless music enthusiasts into looking at music, its structure and composition in a far different light. As mentioned above, The Chamber Music Society of Lower Basin Street often went to great lengths to illustrate these very points. It was the popular success of The Chamber Music Society . . . that inspired the Don Lee-Mutual network to create a similar program that began airing in the Winter of 1944. Called Music Depreciation, it aired a format very similar to the long-running Chamber Music Society series, but in an even more abbreviated and light-hearted tone. And in a nod to the era, the overarching theme of most broadcasts was Swing Music of the era. The program was in all likelihood the brainchild of Ruben Gaines, a poet, writer and radio broadcaster with a flair for irony and music education. His previous Meet the Band series over Don Lee equally sought to shed light on not only the history of music, but its proponents as well. Gaines assembled the team for Music Depreciation comprised of the brilliant and versatile composer and arranger, Frank De Vol, and the equally gifted Les Paul and his Trio. While Frank De Vol had already made a name for himself as a popular arranger, Les Paul was only just coming up in the world of broadcast entertainment. What Gaines couldn't have known is that Frank De Vol had a brilliant gift for comedy as well. Remembered as much for his four Academy Award nominations for Film scoring, De Vol is probably remembered even more fondly for his brilliant deadpan comedy roles during his career as a Film and Television actor. Ruben Gaines, himself a wordsmith of some repute, enjoyed playing with the names of the ensemble and its guests in each installment: Gaines himself was "Dr. Rubenyi Gaines", Paul was "Professor Leski" and Frank De Vol was, predictably, "Dr. Frankenstein." Each new guest was given their own Rubenesque moniker for the remainder of the twenty-four installment series. On the 'serious' musical side, the series was a brilliant counterpoint between classical pieces brilliantly arranged by De Vol, countered by Swing and Jazz. The series showcased some of the finest proponents of popular music of the era. Featured were such artists as Peggy Lee, Mel Torme and The Meltones, Neil Hefti, Herb Jeffries, Illinois Jacquet, Margaret Whiting, Martha Tilton, Eddie South, Kay Starr, Andre Previn, Billy May, Helen Ward, and Buddy De Vito among many others. The format would introduce the guest artist, then launch into a popular classic piece, arranged in a more modern fashion by Frank De Vol and his orchestra. The remainder of the format would combine selections by the visiting artists, with one or two more pieces by Frank De Vol or Les Paul. The program was by no means the equal of The Chamber Music Society of Lower Basin Street, but it did showcase some budding talents that would go on to worldwide fame throughout the entertainment industry--Andre Previn, Mel Torme, Peggy Lee, and Neil Hefti to name a few. The series also provides individual showcases of some of the Jazz icons of the era: Illinois Jacquet, Herb Jeffries, Billy May, Eddie South, Murray McEachern, and Margie Hyams, among them. It was also a marvelous showcase of the great female band singers of the era: Helen Ward, Magaret Whiting, Kay Starr, and Martha Tilton. While the format was apparently unsustainable, it nevertheless provided both Frank De Vol and Les Paul their first nationwide spotlights, in a prelude to what would soon become two of the music industry's great legends. De Vol would go on to great Film scoring success and a third career as a gifted comedic character actor. He'd also go on to back Ginny Simms, Jack Smith, and Dinah Shore over Radio. Les Paul would go on to become a Jazz, Blues and Rock and Roll legend in his own right. Upon completing Music Depreciation, Don Lee-Mutual featured Les Paul in another series, The Feeling Is Mutual, in much the same solid supporting musical role. Ruben Gaines left the Continental U. S. shortly after the end of the series for Alaska, where he became one of Alaska's most notable broadasters and poets. One comes away from a full listening of this series with an impression of the richness of uniquely American treatments of classical standards from the world over, as well as highly impressed by both De Vol and Paul's versatility. Gaines' humor, while aparently well received by the show's live audiences, seems to try far too hard to get a laugh with the passage of seventy years, but not for lack a quick mind. The patter simply seems a bit overkill after the first four or five programs. This is the only distraction, however, to a wonderful little half-season gem that was otherwise brilliantly assembled and produced. Run Dates(s)/ Time(s): 44-10-29 to 45-04-22; MBS [KHJ]; Twenty-six, 30-minute programs; Sundays at 8:00 p.m.
Recurring Character(s): Frank "Dr. Frankenstein" De Vol, Les "Professor Leski" Paul and Ruben "Dr. Rubenyi" Gaines.